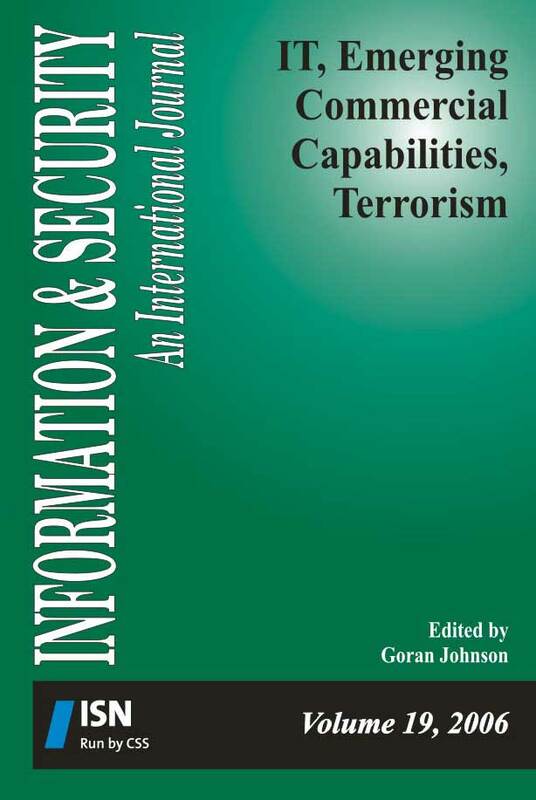 This volume presents several aspects of the linkage between terrorism and advanced information technologies, focusing on the opportunities of new commercial capabilities, and also analyzes the response to terrorism by NATO and armed forces, emphasizing roles of special operations forces. The specific issues examined are terrorist usage of the internet, emergency and disaster response systems, novel research results in iris-based recognition for identification and secure authentication, terrorism at sea and the related issue of maritime piracy. Editorial. "Advanced Information Technology and Terrorism." Information & Security: An International Journal 19 (2006): 5-6. Conway, Maura. "Terrorist ‘Use’ of the Internet and Fighting Back." Information & Security: An International Journal 19 (2006): 9-30. Johnson, Goran. "Information Technology and Terrorism: The Impact of Emerging Commercial Capabilities." Information & Security: An International Journal 19 (2006): 117-118. Johnson, Goran. "Counterterrorism Related Internet Sources." Information & Security: An International Journal 19 (2006): 119-132.